The Vargrim are natural sailors and raiders; their settling of lands not their own lead to conflict between them and both the Artorians and Pidonar. The Vargrim persist for their own lands are hard to farm in comparison to Artorian lands. Undisciplined, individualistic warriors driven by a culture that values courage as much as wealth and their warlike gods, they are known for their bravery and fury in battle. 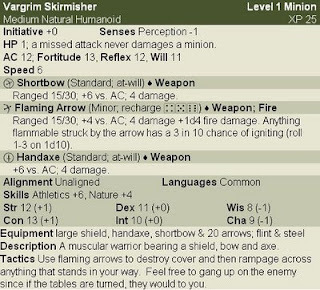 About 30% of any Vargrim force is made up of skirmishers who fight on foot; these warriors are fierce in battle yet know the wisdom of employing bows. The skirmishers will fire arrows before they charge into battle with handaxe and shield. The skirmishers also have some woodscraft about them and can forage if need be for a while; letting them travel further than most raiders might. About 25% of any Vargrim force is made up of these warriors; the raiders are fierce and strong if not always tactically sound. Yet these warriors is not easily contained, heavily armoured and given to devastating charges at the start of a fight, they reap an enemy headcount as their axes rise and fall with devastating effectiveness. 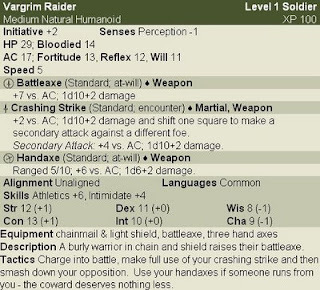 The raiders occasionally take time to pillage if no immediate threat is apparent; usually in battle they are too incensed or engaged in combat to be able to search effectively. Instead they are more concerned with glorious battle and fighting foes so they can loot at their leisure. Fleeing a raider is often cause to gain an axe in the back as well. These warriors are known for the red rage that fills them in battle and the bearskins they wear; their fury is such that it terrifies many who face it. 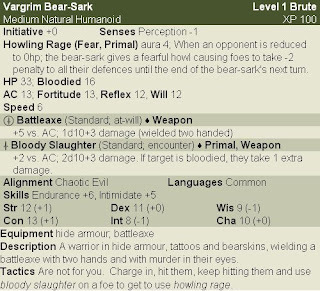 About 15% of any Vargrim force is made up of bear-sarks. 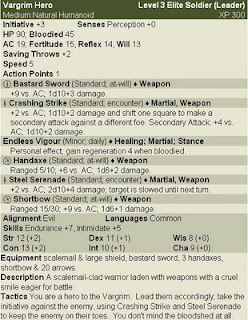 Their lack of discipline makes them a risky proposition but in melee, few soldiers want to face them. The bear-sarks are incredibly tough and employ scarification and tattoos to lend themselves a near-inhuman air; such cruelties are to them as natural as breathing. The howling they make when they render a foe helpless terrifies any who hear it for they cannot believe something could make such an inhuman noise. About 20% of any Vargrim force is made up of these warriors. They have survived life as a raider and are now eager participants in raids and violent assaults on the enemy. They are named for the wolf pelts that they wear; each wolfs-head is part of a society of warriors who emulate the wolf's ferocity. Among the bear-sarks, the wolfs-heads are respected for their skill in battle. 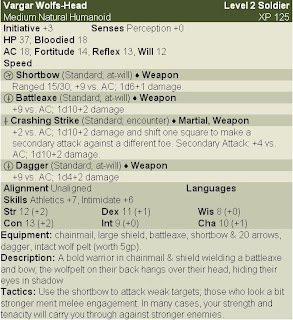 The wolfs-head make use of bow and dagger in order to ensure guards die quickly and subtly; however in a battle, the presence of battleaxe and large shield are a comfort to Vargrim for the wolfs-heads are unafraid of sorcery and perils caused by troll or giant. Undead give them pause, not least because to the Vargrim, such a creature would be declared abomniation. These hardened warriors comprise 10% of any Vargrim force and are called hero by their own people; to victims of a Vargrim raid, different names are used with a look of horror and disgust. These scalemail-clad warriors relish battle and move with a grace belied by the bulk of their armour and shields. The other Vargrim keep a subtle distance from him, even the bear-sarks know that a hero is someone you don't cross. The grudges that a Vargrim hero carries are often legend, their endurance in the face of battle, especially when the blood flows makes them tenacious opponents and their skill with the hero's sword makes them noteworthy amid a horde of axe-wielding warriors. It's said that a hero will go to the end of the world to fulfill a vendetta and the Vargrim are known for this kind of extremity; the hero in particular will think nothing of attacking at the time that best guarantees victory.